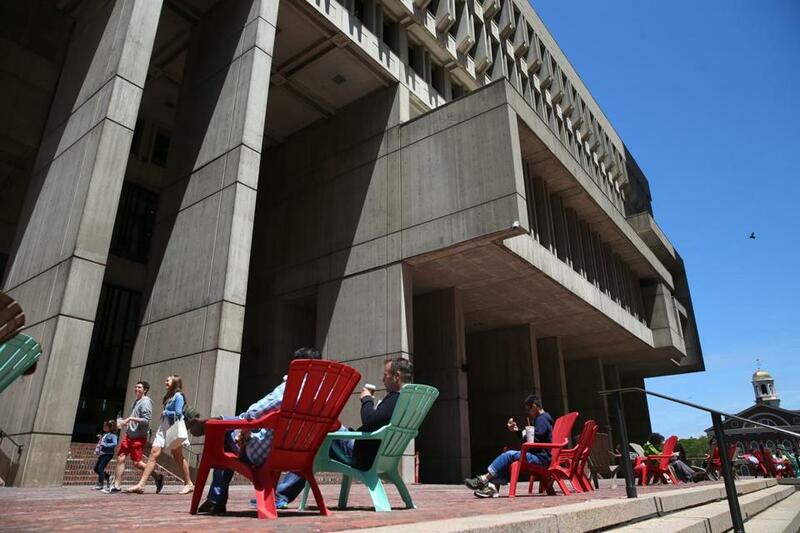 Can Boston City Hall Plaza become a hip spot? Plastic chairs were recently stationed on City Hall Plaza. What could be next for the concrete expanse? First came the food trucks. Then, plastic Adirondack chairs, requisitioned from Home Depot. Next week, the cool kids hope to unroll a 40-foot-by-40-foot patch of green AstroTurf to host lawn games, such as bean bag toss. Did hipsters take over a vacant lot in Somerville? No, this is all going down on the plaza. As in City Hall Plaza, historically the most maligned public space in Boston. Mayor Martin J. Walsh is trying to make the red brick expanse cooler than a snow pile in July. There are discussions about potted plants, umbrellas, doubling the number of food trucks. The Walsh administration’s long-term plans may involve partnering with a private firm to add more excitement to the plaza. The city is expected to solicit ideas next month, with the goal of having an operator in place early next year. But Walsh did not want to wait until then to lure the public to the plaza. The mayor demanded quick improvements for short money. The chairs may have been the best $800 the city ever spent. The AstroTurf is expected to cost $630, including shipping. The administration also plans to take a broader look at municipal holdings in Government Center, which includes the plaza, City Hall, and the 11-story city-owned building at 26 Court St., which the School Department recently vacated. Will Walsh heed detractors of Brutalist architecture and tear down City Hall?